The Ramsar Advisory Mission (RAM) is one of the most valuable tools available to Contracting Parties to the Ramsar Convention on Wetlands. A RAM is a technical assistance mechanism through which a Contracting Party may request expert advice about how to respond to threats to the ecological character of a Ramsar Site and associated wetland issues. This Policy Brief is produced by the Scientific and Technical Review Panel (STRP), with assistance of the Ramsar Secretariat. It seeks to assist Contracting Parties to the Convention and, more specifically, decision makers in Ramsar Administrative Authorities and National Focal Points in further understanding the RAM concept, the value of RAMs, as well as lessons learned on their effective application. 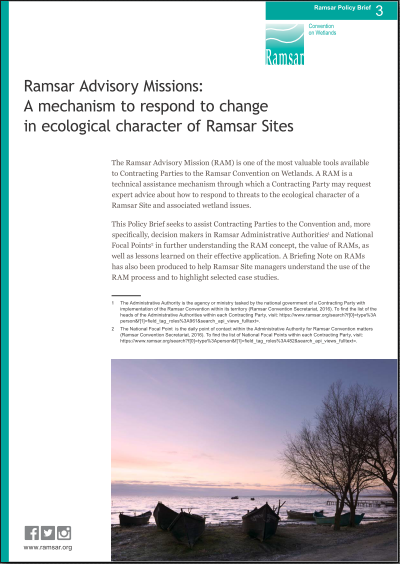 A Briefing Note on RAMs has also been produced to help Ramsar Site managers understand the use of the RAM process and to highlight selected case studies.